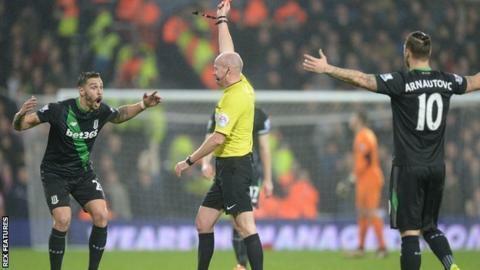 Stoke's appeal against Geoff Cameron's red card during Saturday's 2-1 defeat by West Brom has been successful. The USA defender's three-match ban has been withdrawn and he is now available for Tuesday's League Cup semi-final first leg against Liverpool. Cameron, 30, was sent off in the 82nd minute at The Hawthorns for a retaliatory push on Argentine Claudio Yacob following a tackle. An independent panel concluded the referee made an "obvious error".